Every household should have a metronome and now with smart phones and tablets readily accessible to most students, there’s no excuse! There are dozens of metronome apps out there, so I took some time perusing the iOS App Store and chose one of my favorites as the subject for this metronome app review. 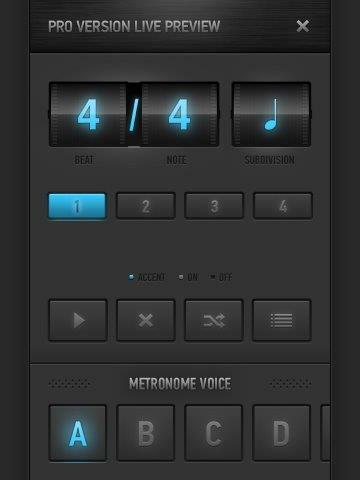 This app is actually two in one: a metronome and a timer. It features an intuitive main screen that gives you three ways to set the tempo. 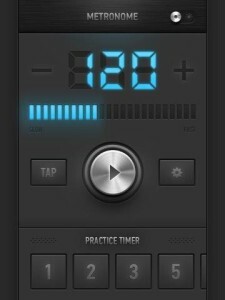 You can make rough adjustments to the tempo by dragging the blue indicator bars left (slower) and right (faster). To make finer adjustments, you tap the plus and minus keys. Finally, you can tap the “tap” button at the tempo you wish to play and the app will count the number of beats per minute and set itself accordingly. 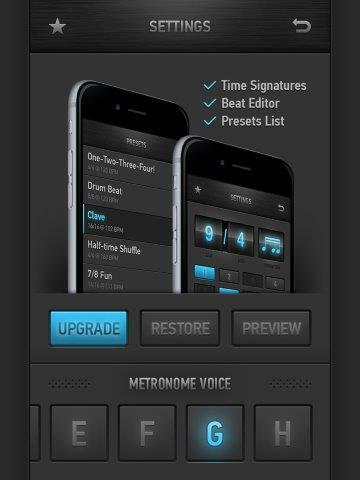 To start the metronome, simply tap the circular button with the “play” arrow in the middle of the screen. At the top right, there is a switch you can toggle to turn on or off a light that pulses with the beat. I didn’t test the iPhone version, but according to the developer’s website, the iPhone version also has an option to turn on an LED flash. 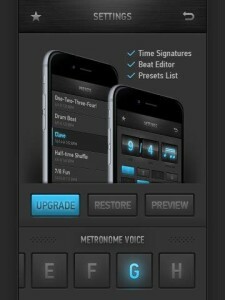 Below the metronome is a practice timer. You can scroll left and right to select one of the eight preset durations from 1-30 minutes (in varying increments) and to start it, you tap the number indicating the number of minutes you want to practice. I can see this being a really handy feature for if you like to divide your practice time into segments (5 minutes warm up, 20 minutes piece #1, etc.). By default, the metronome automatically starts beating when you set the timer, but you can turn it off by pressing the metronome start/stop. The gear button takes you to the settings page, where you can change the metronome voice. There are eight variations, including 7 different ticks and one that imitates a human voice counting “1, 2, 3, 4.” The voice is cute (almost cartoony-sounding at the higher tempi) and got a chuckle when I first played it for some musician friends. We all thought it would be difficult to play along with the voice, but I could see some of my students being entertained so I certainly won’t rule out its usefulness just yet. Finally, there is the option to upgrade to MetroTimer Pro ($2.99) and a preview of everything it has to offer. The Pro version gives you compelte flexibility for changing the time signature. You can set a meter with as many as 16 beats on top and dow to the 1/8th note on the bottom. There are countless options to subdivide the beat. Under the time signature are numbered buttons representing each beat. Here you can select on a beat-by-beat basis which beats you want accented with a different tone (buttons lit in blue), which you want to beat normally (light gray), and which you do not want to beat at all (dark gray). This granular control is not something I’ve seen before and, although I tend to use only the most basic ticking features of a metronome, if you are someone who uses these beat patterns, the interface and setup of MetroTimer is fantastic. Pressing the start/stop button does what you’d expect, the “x” button resets the beat to default (accent on beat 1), the “randomize” symbol gives you a random arrangement of accented, silent, and regular beats, and the “list” symbol brings up a library of preset beats. I could see these being really fun after a student is familiar with a song, but they might be too distracting for initial learning. If you click the “plus” button, a window will pop up asking you to name your new preset. When you give it a name, it saves whatever settings you currently have on the preview page. Every minute or two, while using the Pro version preview, a shade drops down inviting you to upgrade, but you certainly have adequate opportunity to test it before purchasing, which is always nice. If you’re not ready yet, just tap “preview” again to keep previewing. This app’s interface is simple, attractive, and intuitive. I like that I don’t have to click around through multiple screens to set the app. In the free version, the only setting controlled through the settings page is the Metronome Voice. I consider this to be a “set it and forget it” setting, so I’m glad it’s out of the way and not adding unnecessary distraction to the main screen. As long as you are in app, the iPad will not go to sleep. This may not be great for battery life, but I would find it annoying to have to wake it up again constantly during a practice session. For the longest time I couldn’t figure out what the “Accent,” “On,” and “Off” indicator lights meant on the Pro preview screen. I thought they were buttons at first, but I couldn’t change them. Finally, I realized they are just a key to show the selection options for the beat number buttons. When viewing 4/4 time there is a big gap between the beat numbers and this key, so I didn’t connect the two. Just outlining the key with a box and/or moving it above the beat buttons might make this more obvious. An option to make the screen dim after 15 seconds to improve battery usage might be nice, although even this could be distracting to some students if the screen dimmed while they were playing. I would like the feature personally, but I work with a lot of young students so, professionally, I may not want it. I talked to a teenage pianist who liked the look of the app, but thought it would be fun if the colors of the display could be changed. Overall, I was really impressed with the MetroTimer app and will definitely be recommending it to students of all ages and skill levels.